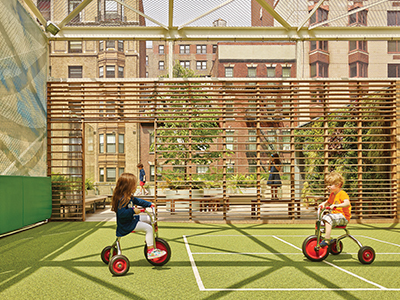 Sara Grant, partner with New York-based Murphy Burnham & Buttrick Architects, spoke on Oct. 19 at the FitKids Symposium on the topic of Designing Spaces for Play. NEW YORK — Sara Grant, AIA, LEED AP, partner with New York-based Murphy Burnham & Buttrick Architects (MBB), spoke on Oct. 19 at the FitKids Symposium on the topic of Designing Spaces for Play. The talk outlined strategies for creating high-quality active spaces for children. The half-day symposium was organized by the AIA New York Chapter and the city’s Department of Health and Mental Hygiene, and took place at the Center for Architecture in New York. It was intended to examine and elevate a variety of pragmatic and achievable design approaches to advance access to spaces that support physical activity for children. The overarching goals of the architecture firm’s designs are to improve overall student health and prevent obesity, cardiovascular disease and other chronic conditions, affording children the opportunity to become healthy adults, according to Grant. One of the key trends in designing spaces for play is advancing access to play zones that boost student health. The Rodeph Sholom School in New York is one example of a school where MBB has helped to support the health and physical education of its students, and is one of the projects MBB spoke about at the symposium. MBB installed a third-floor truss that allowed the architecture firm to expand the school’s gymnasium by about 50 percent in 2009, according to Grant. In addition, MBB completed the school’s 79th street play decks, with one for the lower school and one for the middle school in 2017. 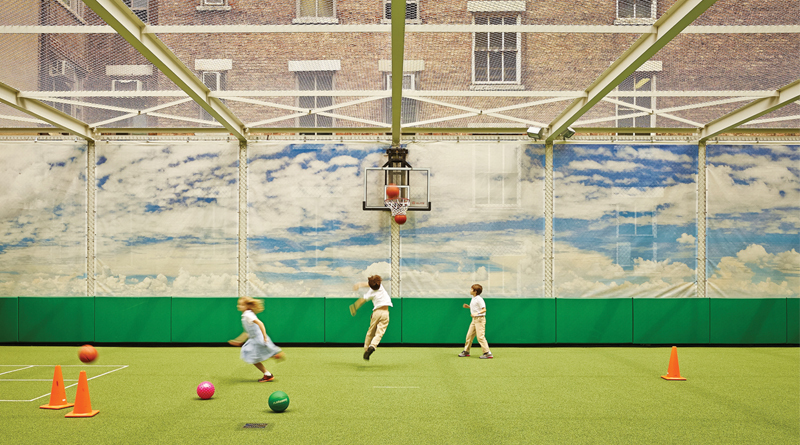 Renovations to the Rodeph Sholom Lower School gymnasium enabled the school to be able to have full-court games and spectator seating that was previously not possible due to space limitations. In addition to creating more play space for the Rodeph Sholom school, the gymnasium provided a space to create a rooftop garden with plantings that enrich the school’s environmental curriculum. The inspiration for the rooftop garden came from the school community’s commitment to pursue LEED certification for the project, and the design team worked with the faculty to create sustainable systems for the project. These sustainable components include rainwater collectors, water-saving faucets, dual-flush toilets and photovoltaic panels in addition to the rooftop garden. MBB made use of rooftop space in yet another way with the Loyola School in New York in December of 2017. A play space was built on the rooftop of the school’s gymnasium, as a method to work with the otherwise limited space available, according to Grant. To meet the challenge of creating more space for the school as well as allowing a more open feel, MBB used a “retractable system” that has a very light structure. “[It’s] lighter than what you would typically see for this type of caged space,” according to Grant. Another project still in the works is the Grace Church High School in New York, with completion expected in the fall of 2018. This project — the addition of a double-height gymnasium complex atop a school in an existing masonry industrial building — floats on acoustic slabs to eliminate noise transmission to classrooms below. The expansion will include the extension of the main stairs up to the top floor, a regulation-size gym and a student commons as well as new offices, locker and storage rooms, golf simulator and fitness rooms. The glazed roof, which allows diffused, natural light to filter into the gym, was designed with a low profile to minimize its visual impact on the historic neighborhood. 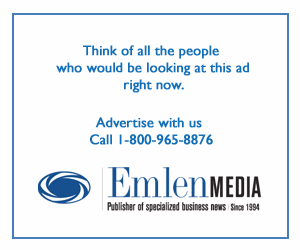 To read the entire article, check out the November/December issue of School Construction News.